Amazon used to have a feature called Listmania! You could make a list of up to 40 books that was visible at Amazon's website. Ten years ago I created a Listmania! 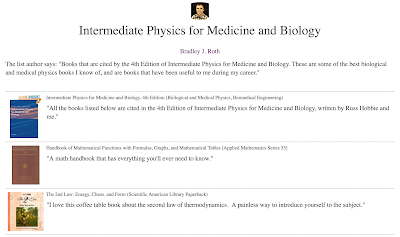 list related to Intermediate Physics for Medicine and Biology, reproduced below. Because the list is old, it does not include recent books (such as The Optics of Life) or books that I have discovered recently (such as The First Steps in Seeing). To learn about newer books, search this blog for posts labeled “book review.” Amazon has discontinued Listmania!, but you can still find the lists if you look hard. I miss it. If you are interested in what I read for pleasure, look here. 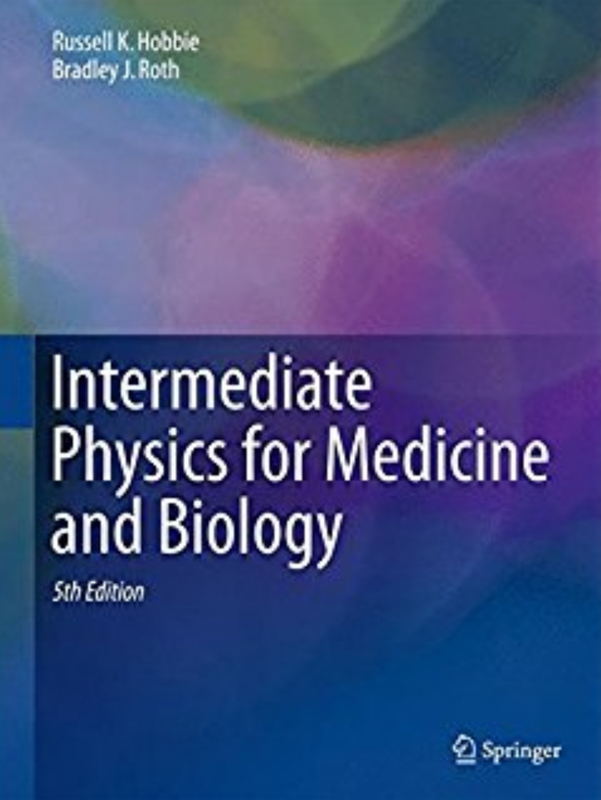 All the books listed below are cited in the 4th Edition of Intermediate Physics for Medicine and Biology, written by Russ Hobbie and me. A math handbook that has everything you'll ever need to know. I love this coffee table book about the second law of thermodynamics. A painless way to introduce yourself to the subject. Classic in the Medical Physics field. This book explains why we devoted an entire chapter of Intermediate Physics for Medicine and Biology to the exponential function. The second edition of the book has much the same content as the first, but the quality of the printing and illustrations is vastly improved. Benedek and Villars were pioneers in biological and medical physics textbooks. The best book about the role of diffusion in biology that I know of. Fine book to study imaging algorithms. Great book on a little-known topic. One of my favorites. Written by a physiologist with an interest in physics (as opposed to Hobbie and I, who are physicists interested in physiology). My favorite modern physics textbook. What physics list could be complete without Feynman? Excellent book to learn the biological and medical applications of chaos. Wonderful picture book. Great way to visualize the relative sizes of biological objects. Good, thick tome on bioelectricity. Great place to learn about the biological effects of radiation. Standard textbook in medical physics. Hendee is a pioneer in the field. The bible for information about ion channels. Learn about the history of pacemakers and defibrillators. The place to go to learn about radiation therapy. Classic work describing how the world looks at different length scales. Required reading by anyone interested in science. Great way to learn about the physics of the electroencephalogram. Standard textbook for a class in bioelectricity. My go-to book on numerical methods. Best introduction to electricity and magnetism I know. Part of the great Berkeley Physics Course. Great intuitive introduction to statistical mechanics. Part of the Berkeley Physics Course. Need a little review of vector calculus? This is the place to find it. Great book on biological scaling. Great physiology book. Quirky, but fun. Best book for a first course in nonlinear dynamics. Best book I know of on biological fluid dynamics. Not too mathematical, but full of insight. I recommend all of Vogel's books. Great for understanding the fluid dynamics of the circulatory system. I often find probability theory boring, but not this book. An oldie but goodie. Classic by Art Winfree, who was a leading mathematical biologists. Be sure to get the 2nd edition. Winfree's classic on the nonlinear dynamics of the heart. Comprehensive reference on cardiac electrophysiology.